Through her research, Mary Brown is uncovering new solutions for a wide range of human diseases. In the process, she’s also made the world a better place for endangered tortoises. Brown’s research focuses on the disease properties of mycoplasmas, or bacteria that lack a cell wall and thus aren’t affected by penicillin and other antibiotics. Brown has found that these bacteria, which cause respiratory and urogenital infections, are rather indiscriminate among the animal kingdom. Among the numerous species Brown has studied, she has discovered that mycoplasmas infect all of their hosts in almost exactly the same way. When Brown identified a species of mycoplasma that causes upper respiratory tract infection in two species of endangered tortoises, she caught the attention of the wildlife conservation community. 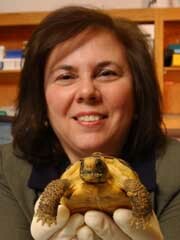 According to infectious diseases and pathology Chair John Dame, Brown’s team has provided “the foundation for development of predictive mathematical models that may aid in the conservation of these tortoise species.” Her work with mycoplasmas in cows has led to the complete genomic sequencing of M. bovis F1, a strain of a disease related to tuberculosis in humans, which will be used for further pathogen studies. Brown has also studied the effects of infection during pregnancy and its results on reproductive function. Brown is using her research in collaboration with other researchers to study the link between periodontal disease and pregnancy loss and the effects of nicotine exposure on pregnancy. She has also created a model to identify genes involved in urinary tract infections. Brown also contributed to the establishment of UF’s Emerging Pathogens Institute, through which researchers study, prevent and contain new diseases.